Flood insurance provides you with coverage when your stuff and/or property is ruined as a result of… you guessed it, flooding. 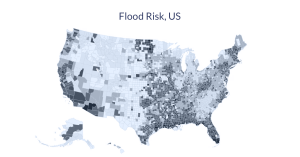 Flooding is one of the most common natural disasters in the U.S. Whether you live in the Northeast and face the dreaded thawing of winter, or in the Deep South under the threat of hurricane season, you know how important it is to make sure you’re properly covered. That said, flooding (by mother nature) isn’t covered by your typical renters or homeowners insurance policy. In fact, any water damage from the outside-in isn’t covered on standard homeowners or renters policies. Some states, such as New York, even have a special exclusion for direct or indirect loss resulting in flooding. So, what gives? Why aren’t you covered from flooding if it fits the parameters of sudden and unexpected, two of the main tenants of events your insurer will cover? Well, insurance is supposed to provide you with a safety net for sudden, accidental, and abnormal cases in which your stuff is ruined. Flooding, though, is so common and apt to cause serious damage that most home insurers can’t provide coverage for it. It’s a risk they can’t take. But you can avoid this risk (and sometimes have to) by purchasing a separate flood insurance policy. If you live in an area prone to flooding and need to take out a mortgage on your house, your bank might make you get a policy – it’ll protect your investment and their stake in your place. Even if you don’t think you need flood insurance, it’s a good idea to get it, especially considering the damages this natural occurrence can cause. Purchasing flood insurance is relatively easy – you can do it through your insurance agent or directly through your insurer if they participate in the National Flood Insurance Program (NFIP). Flood insurance covers two main things: your stuff and your place. By stuff we mean your personal property – we’re talking clothes, electronics, curtains, carpets, and other valuables up to $2,500. By place, we mean things like flooring, carpets, built-in appliances, walls, ceilings, and more. Think of is this way: if you were to tip your house upside-down, whatever wouldn’t fall out goes under this category. In general, flood insurance is a bit finicky. So, like all insurance policies, make sure you read everything and you understand what you’re buying! Two common flooding scenarios that wouldn’t be covered by insurance include sewage backup and flooding from rain. Take note: In addition to the above, things that resulted from flooding and could have been prevented with proper cleanup and/or attention (like mold, mildew, moisture, etc.) won’t be covered.